Destroyit 3804SC is an excellent departmental/office shredder. Dimensions: 23 1/4" X 25 1/4" X 38 1/4"
Destroyit 3804SC Strip Cut Paper Shredder is a replacement model for Destroyit 3803SC and it includes some new features and some improvements. It comes with a Safety Protection System (SPS) package which has a transparent safety shield in the feed opening and is controlled electronically. Operational status is displayed with the help of color codes and back-lit symbols by an Easy-switch control element. Whenever the cabinet door is opened or the shred bag gets full, it stops automatically. In case of paper jam, it reverses and stops automatically. Heating cannot cause much damage as there is double protection mechanism in it. Hardened steel shafts can shred Credit cards, CDs, papers, paper clips and staples. 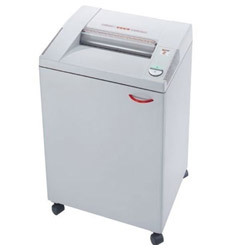 Destroyit 3804 strip cut departmental shredder runs on standard voltage i-e 100 to 120v. The motor is quite powerful and runs continuously. Demo not available at the moment. Please visit later for updates. Dimension 23 1/4" x 25 1/4" x 38 1/4"
Lifetime Limited Warranty on cutting shafts. One year warranty on all other parts, excluding wearables.